height - How tall are you? This number is important to find the right size of the jerseys and other clothes intended for the upper body part (vests, ...). 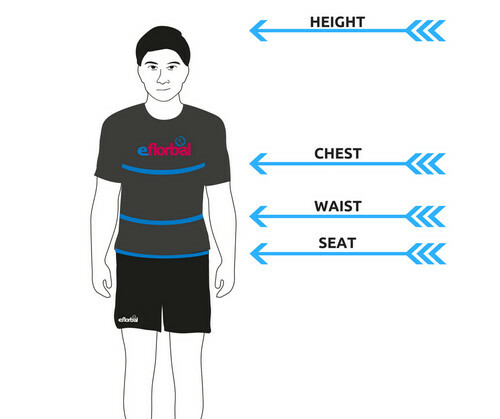 chest/bust circumference - Measure at the fullest part of the chest, take the measurment of the size for the jerseys and other clothes intended for the upper body part (vests, ...). waist circumference - Measure around the natural waistline. Take a measurement of this size for the pants and other clothes intended for the lower body part (compress shorts, ...). seat circumference - Measure at the fullest part of the seat. Take a measurement of this size for the pants and other clothes intended for the lower body part (compress shorts, ...). Compare measured data with the chart below. If you cannot find that measured value in the chart, find the nearest size. Example: The chest/bust circumference is 94cm, the chart says the nearest value is 92cm, which fits for the size M. If your body ratio is between any two sizes, choosing smaller size will make your clothes close-fitting, on the other hand choosing bigger size will provide baggy clothes. These charts are just approximate. The sizes of individual producers may be different. Make a suggestion about your design and we create clothes according to your wishes! Choose one of the top quality Sublimated floorball products, choose colour you like, send us the logos in curves (.pdf;.ai;.svg;...) and we will create a preview that can be edited until you'll say it is done! Each product has its own size chart. If you still are not sure, don't think twice and contact us, we will do our best to help you with. In case of ordering an incorrect size just read changes and returns section, where you can find simple instructions what to do in this case.